December, the final lone cold month of the year. Where in a few short weeks, we will celebrate the closing of 2017.....but not before we have one final sale for the Shop!!!!!! That's right, we're not going to just abandon 2017 with nothing in December for you guys. I mean, sure it's cold outside (it is for me, I'm Canadian and Sheer is over in Poland), but we're going to close out with 2017 with a hot sale for you guys. PROMO: 10% off EVERYTHING in the Shop! It's the season of kindness, joy, happiness. The season of giving, so give yourself that nice TAW Swag you've been wanting all year. If you fill out the Verification Form, we'll give you the TAW Swagster TAB. So go for it! 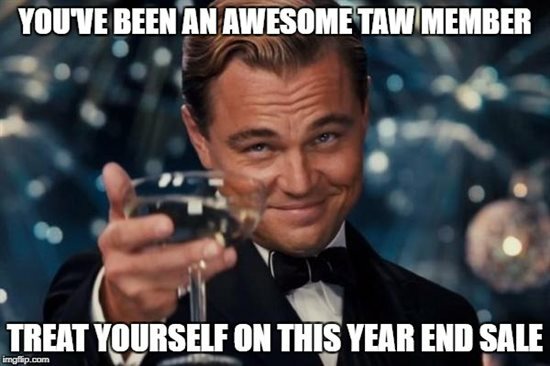 Close the year out wearing the TAW Swag you truly deserve. Get yourself that T-Shirt, Coffee Mug, or Hoodie you've been wanting and don't forget to use the promo and save some cash. For those who do not know what Black Friday is, it's the Friday that follows US Thanksgiving. It's also a nightmare in stores, where thousands of people flock to get amazing deals in stores. For employees and "first responders" (including security guards), it's a nightmare. If you ever thought that the mobs for getting that latest iPhone were insane, Black Friday makes it look like preschool. And we all know that "Cyber Monday" is when some of the best online deals hit. 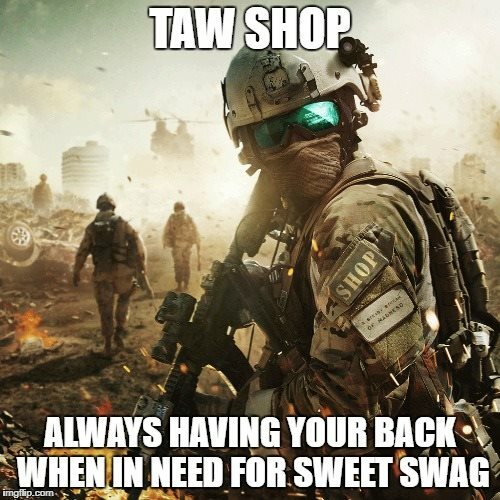 But we at the TAW Shop, we want our members to be safe when shopping. That's why we're bringing you an insane deal this Black Friday/Cyber Monday Weekend, but you're going to be able to shop from the safety of your own computer. The sale starts Friday November 24th and will continue until the end of Monday November 27th. But we're not done with bringing you just great savings....oh no! 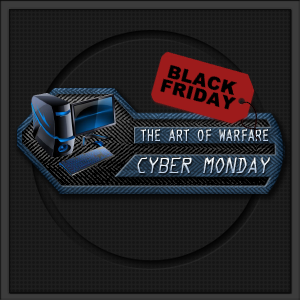 We've teamed up with GFX Division to have an EXCLUSIVE TAB made just for Black Friday/Cyber Monday weekend sales. 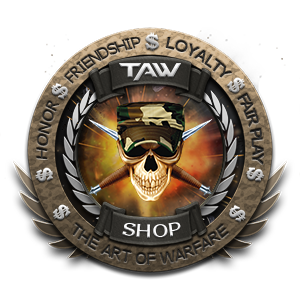 So if you make a purchase from the TAW Shop and fill out our Verification Form, not only will you be awarded the standard Swagster Tab, but we're going to add the Black Friday/Cyber Monday Tab to your Dossier too. The Black Friday/Cyber Monday Tab is only eligible for purchases made this Nov 24th to 27th and verification form filled out. So this is the PERFECT time to get that TAW Item you want, get 2 cool TABS, save some money...and get the item before Christmas. 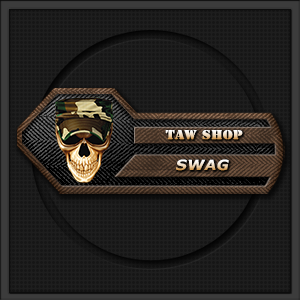 Stay Safe this Black Friday/Cyber Monday, Shop TAW. Pub Quiz and Game Night! Tomorrow, 18 November, @ 8pm GMT will be SOCOP’s first TeamSpeak event. Come join the fun and meet some new people! Check the “[SOCOP] Events” TS channel for final details. SOCOP have a few announcements to make! First off, thank you to everyone that participated in our Events Survey. We received some great feedback that will help us to move forward with event organization. 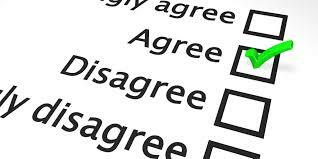 You can review the survey results by clicking the link here. After the winner-takes-all tournament, test your knowledge of video games with a Pub Quiz brought to you by game show host Arwith. If you’re having such a good time that you can’t leave and want to hang around, there will be an optional Pictionary challenge afterwards. 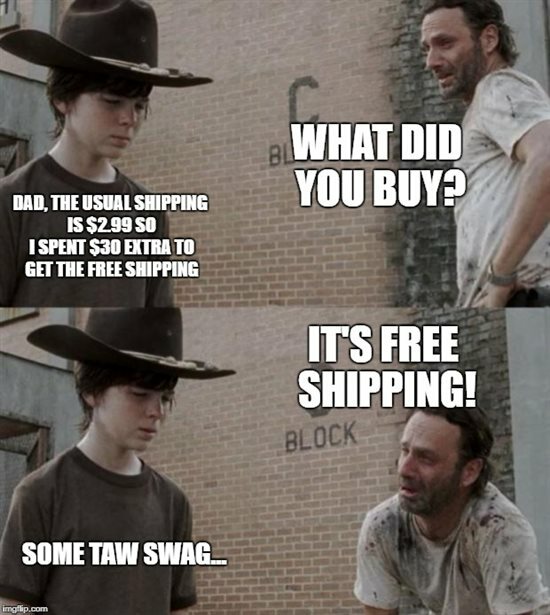 FREE shipping of your favourite TAW swag?! Make no mistake, the time has come to spread the joy! For a limited time you can get your sweet TAW swag shipped to you for FREE! But as with all good things, there is a catch. This promotion is only available for a limited time. Just take a look at that amazing Elder Scrolls Online Division shirt. No, seriously, just hop down to your NA or EU shop and look at that beauty! Here's the best part: you can customise your stuff just the way you like it. Can't find your Division's swag? Ask your CoC and your Division Command can work with us to prepare some amazing things for you! 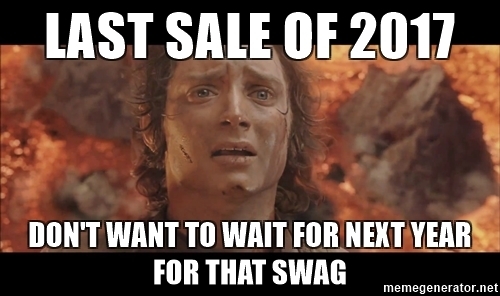 So don't wait for it and grab your merchandise while it's still hot! Since the day I joined GFX, Abnormalskillz has been my mentor with regards to TAW and the GFX division. He has always lead by example. He is very talented, patient, professional, detail oriented and has taught this officer a great deal about the division and has made me the officer I am today. 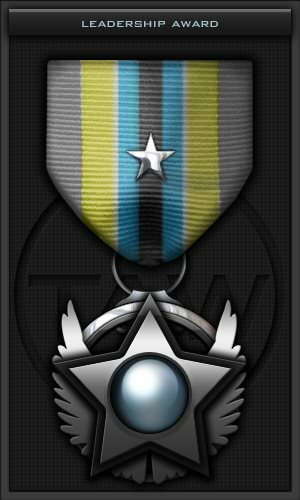 Without further adieu, Abnormalskillz has been awarded the Leadership Medal for this outstanding work and in changing the face of the GFX Division for the better. It's an honor to present this medal to LTC Abnormaliskillz. Please take a moment to congratulate Abnormalskillz. 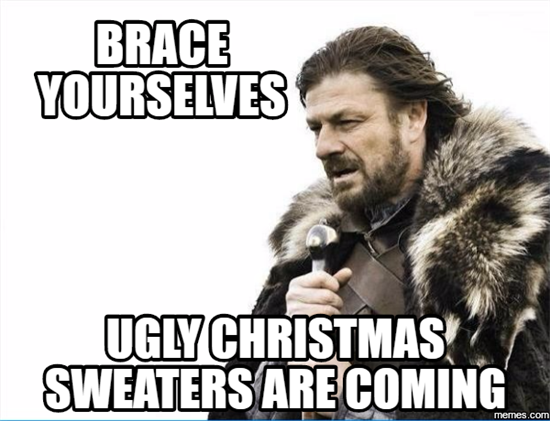 Ugly Christmas Sweaters Now In Stock!!!!! Actually, they are already here. 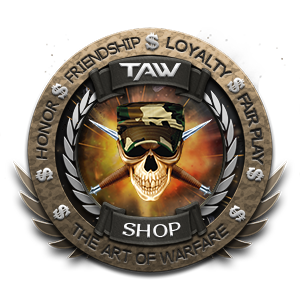 Now loaded in the TAW Shop NA and EU are the first ever TAW Ugly Christmas Sweaters. Our good buddies in GFX kindly helped create the design for our Ugly Christmas Sweaters. You can change the product they sit on, the base color of the sweater as well. Unfortunately on these designs, Editing the colors of the designs themselves will not be available. But there will be ones with White Snowflakes coming soon. These sweaters are already available for purchase. Get yours now so you can make your family and friends jealous over having the best Ugly Christmas Sweater at the party!!! For almost a year these members created shining medals, badges, tabs, seals and signatures. Some of them are working in Graphics Division for few years, now; helping TAW community how they can. Over these months with them, I have been approached by multiple members about their work. You guys asked for them and these members definitely deserve them. Now, I'm kindly asking any members that has had a graphic made by following members take a moment to add your appreciation to their new medals.